“Toilets and feces are normally thought of as very unclean topics, but I would like for people to actively talk about them instead of just thinking that they're dirty." Japan wins for inventing the most creative way to teach kids about toilets. 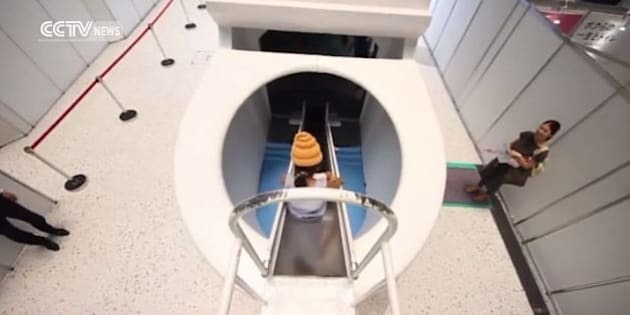 In Osaka, a museum exhibition featuring a poop roller coaster has captured the attentions of kids everywhere. Donning poop-shaped hats, children can climb up a 16-foot toilet and slide into a giant potty. Japan: Schooled about Stool - Osaka wows faecal-focused learnersWhile going to the toilet is often flushed aside as a crass topic for children's education, Osaka has warmly embraced the topic of toilet-tutelage, dazzling faeces-focused learners at the ‘Toilet? The exhibition is a faecal roll-coaster ride of stool-related information and attractions, giving guests the opportunity to slide down an over-sized toilet over three metres high, wear faecal-fashioned hats, and learn from singing, interactive toilets. People visiting the museum also get the chance to examine various types of excrement, both human and animal, in all their glorious shapes, sizes and smells. This special exhibition is titled “Toilet!? - Human Waste & Earth's Future” and was created for two reasons. First, it was meant to encourage children to talk openly about the toilet, and second, to call attention to the fact that 2.5 billion people in the world don’t have access to clean facilities. “Toilets and feces are normally thought of as very unclean topics, but I would like for people to actively talk about them instead of just thinking that they're dirty,” exhibit staff member Tami Sakamaki said. Besides the poop roller coaster, the exhibit also features singing, interactive toilets and various types of stools, both human and animal. Additionally, kids can learn how different types of toilets are used around the world. Last year, the show visited Tokyo’s Miraikan Science Museum where it received quite a bit of media attention for its unique method of teaching an unconventional topic.